The bestselling author of Blindsided, Richard M. Cohen spent three years chronicling the lives of five diverse “citizens of sickness”: Denise, who suffers from ALS; Buzz, whose Christian faith helps him deal with his non-Hodgkin’s lymphoma; Sarah, a determined young woman with Crohn’s disease; Ben, a college student with muscular dystrophy; and Larry, whose bipolar disorder is hidden within. Differing in age and gender, race and economic status, all five are determined to live life on their own terms. 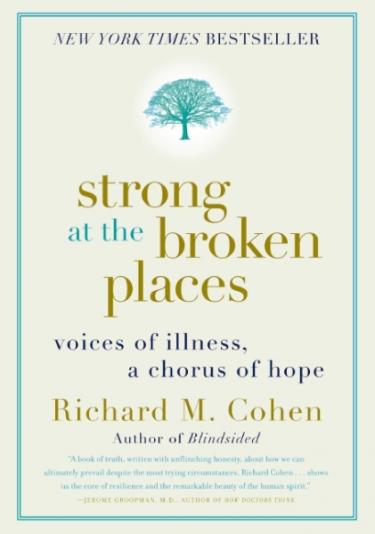 In Strong at the Broken Places, Cohen shares these inspirational and revealing stories, which offer lessons for us all—–on self-determination, on courage in the face of adversity and public ignorance, on keeping hope alive. We are all strong at the broken places—stronger than we think.